by Rob - April 27th, 2016. Twenty years ago tonight, on April 27, 1996, my life changed forever. Aboard the Queen Mary at Long Beach, California, Sheila Finch presented me with the Science Fiction and Fantasy Writers of America’s Nebula Award for best novel of the year, for The Terminal Experiment. 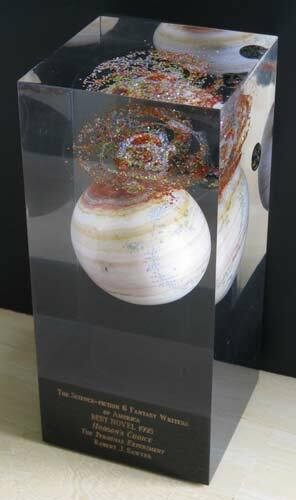 The gorgeous trophy was designed and built by William Rotsler. The large sphere is actually the Jupiter-like Face of God from my novel Far-Seer; the Quintaglio home world is orbiting close to it off at right. William Rotsler was doing Nebula trophy designs based on the author’s work back then. He also did a great one for Greg Bear‘s Moving Mars (red sandstone sphere for Mars), which won the year before I did, and Nicola Griffith‘s Slow River, which won the year after (lapidary stones having sunk to the bottom). Nebula Awards always have the spiral galaxy at the top. And here’s the press release about my win from all those years ago. That’s awesome Robert. It’s so cool to have a trophy of the Quintaglio worlds. Best of luck with your future novels from a faithful fan. That is a gorgeous acknowledgment of one’s work.